Going Live with the Website! This is a resource site for anyone interested in Hardcastle family history in America. Primary focus is on descendants of William Hardcastle, who was born in Virginia, likely in 1714. He migrated to North Carolina about 1750, and left a Will in 1777 which named his children. Most Hardcastles whose ancestors were born in southern states can trace their lineage to William Hardcastle. For a more complete discussion of the history of the Hardcastle family in America, please go to Hardcastle Family History. At the heart of this website is a database that is fully accessible to all who visit the site. Think of the database as a large listing of names of people who are descended from William Hardcastle (1714), plus names of persons who are related to the Hardcastle descendants by marriage. 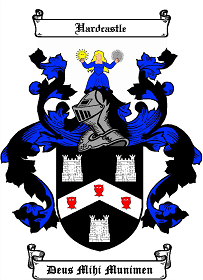 The database is constructed in such a way that all Hardcastle descendants are linked to their parents and children by hyperlinks which connect all the families together. The database also contains a large number of data files (such as photos, obituaries and census records) which are also linked to the individuals to whom they apply. The best way to get started is to access the "Names" menu on this page and locate your ancestor or a person of interest. Clicking on that person's name takes you to their individual page, which contains all information I have on that person. You will note that all children's names are hyperlinks which can be used to access their individual pages. Also, the Hardcastle descendant parent's name is a hyperlink, and you can access the parent's individual page through this link. On many of the individual pages there is a "View Biography" link that contains a comprehensive narrative on that person. I encourage you to read those as you peruse the individual pages. We have a photo gallery page which can be accessed by clicking the "Photos " link on the main menu. The "Recent News" section draws your attention to the most recent postings on the website. We also have a Facebook page for those of you interested in social networking. Thanks for stopping by. Spend time going through the names and information in the database. Come back often as regular updates will be made to the database. One of the best features of the site is the ease with which we can add or modify data. I hope you enjoy the site and will participate in making it grow to be a better resource site for Hardcastle family history.